Help me cook our "Greek inspired" dinner? I scored some nice fresh ground lamb, and also some fresh asparagus. I have some Penne Rigate pasta I'd like to use too. I'm about ready to cook dinner, and I wonder what your ideas would be. I have a well stocked pantry and lots of assorted spices. Anybody wanting to help me cook a Greek inspired dinner? How about adding some rosemary & garlic to the lamb and fry patties. Steam the asparagus and give it a quick stir fry in EVOO and fresh garlic toss the cooked penne in and toss well and serve topped with fresh grated parm and romano cheeses next to lamb burger. AHHH! Beat me to it. I was going to suggest mini meatballs served pretty much the same way. I'll post what I did tomorrow under lamb so the recipe doesn't get lost. Good luck... looking forward for your picture! Sorry I didn't take a picture, Chefmac, but here is the resulting recipe. 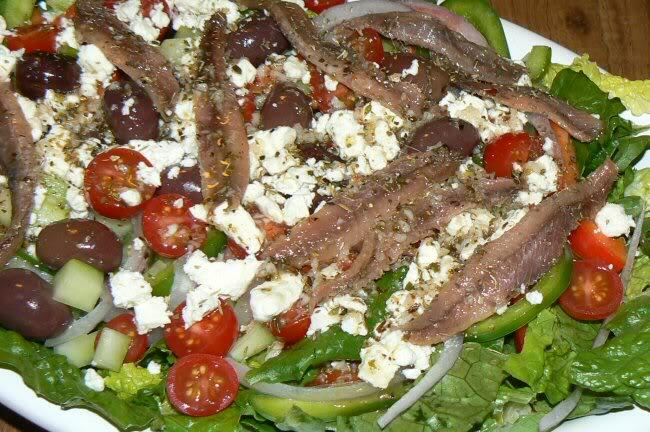 Did you serve it with a Greek Salad? Upah, Upah Kay, Stavros F is my hero.